Binion's in downtown Las Vegas is one of the true old-school spots left in the city. Anybody who was hanging out downtown before the current hipster redevelopment knows the best place to grab a burger in the area -- and one of the best burgers in Vegas overall -- was always the greasy-wonderful "snack bar" counter in the casino. A couple of years ago, Binion's closed its cozy subterranean coffee shop and expanded this "snack bar" spot, and now it's known as Binion's Cafe. And they're still serving up badass burgers. This is the only way to upgrade that nice, juicy, straight-from-the-flattop-grill cheeseburger. 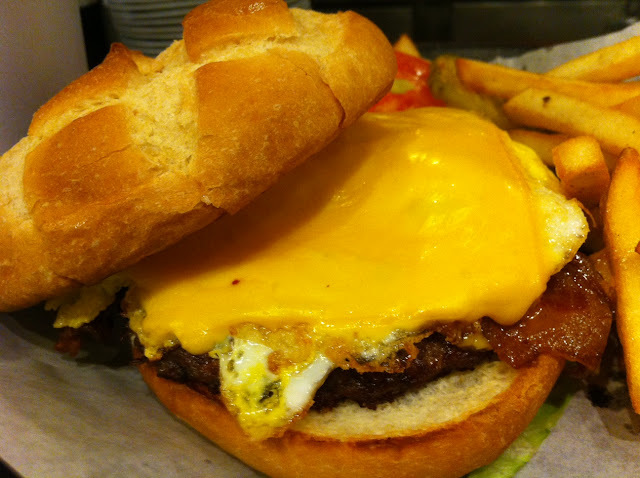 The Hangover has two big strips of bacon, an egg fried hard in butter, a thick slice of American cheese and a nice ground beef patty on a soft, fresh bun. Toss on lettuce, tomato, pickle and onion served on the side, and Binion's superior French fries make this meal a complete breakfast, no matter the hour. The best burgers are from sketchy little diners. It's a fact.